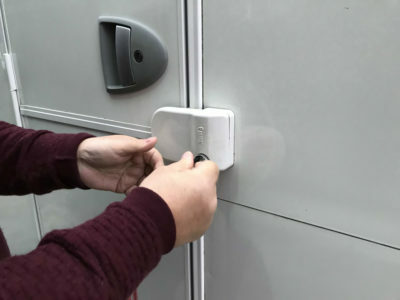 Theft and break-ins are a cause for concern for any caravanner or motorhome owner so it’s always worth looking at some extra security locks to make them more secure and add another layer of protection to your prized leisure vehicle. It’s common sense – the more security devices you fit to your caravan or motorhome, the harder you’ll make it for thieves to break-in and they might just move on by when faced with extra locks to overcome. The weakest entry points to a caravan or motorhome are of course the windows and doors. So, here we take a look at some extra locks you could fit to your tourer or motorhome to provide an extra line of defence. Some of these devices can only be fitted by screwing into the door or side panel, so always check that this won’t affect your caravan or motorhome warranty, before you carry out any work. According to husband-and-wife team at Lock M Out, Polyplastic and Dometic or Seitz Windows make up 90 per cent of all motorhome and caravan windows. 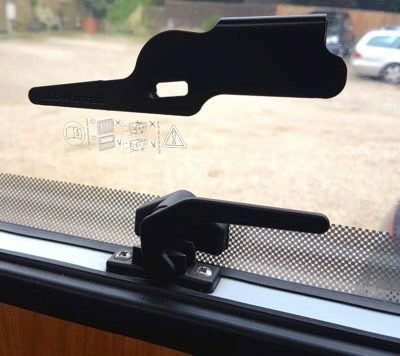 Not impressed by the plastic window catches, they designed and produced the steel Lock M Out device which slides on to the window catch, reinforcing it and jamming it in place, therefore making it less vulnerable if someone tries to force open the caravan or motorhome window. Their devices fit all Polyplastic catches, both bottom opening and sliding, and approximately 75 per cent fit Dometic or Seitz catches. Prices from: £9 for top opening window catches, reduced to £8 each when ordering four or more. Their sliding window devices are £18 each. Key features: Easy to fit, needing no keys, tools or codes. Made in the UK from steel and powder coated in black to match the window catches. Fiamma have both the Safe Door Frame and Safe Door Magnum Frame security locks which are essentially an anti-theft safety block for your caravan or motorhome door. Using self tapping screws the locks can be attached to the inside frame of your habitation door or to the garage compartment, making it more difficult for thieves to get in. Once fitted the Safe Door Frame lock rotates on a pivot to block the door from opening and is then locked into place with a key. To release it, use the key to unlock and then rotate the opposite way so the door can be opened again. Key features: Made of sturdy anodized aluminium. Two keys provided. Choice of white or black. This sturdy hand rail will not only help you get in and out of your caravan or motorhome it also provides an extra layer of security. The handle can be locked into three positions – left across the side of your vehicle; outwards, acting as a grab handle to help with access; or closed across your vehicle door to make it more secure and help prevent a potential break-in. The handrail is fastened onto the side wall of the caravan or motorhome next to the door frame, using 8 x 6mm bolts. Internally the bolt heads are hidden by a clip on cover for a good finish. Key features: Available in different sizes, sturdy, double locking and dual purpose design. Germany company, HEOSafe, has a number of different locks for a motorhome driver’s cab doors, sliding doors, rear doors as well as caravan and motorhome habitation doors. 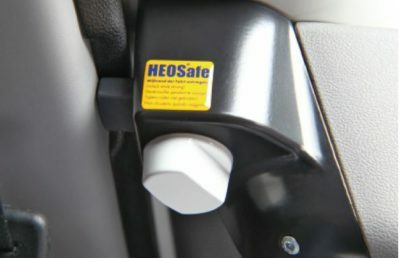 HEOSafe have a range of anti-theft security locks which fit onto the exterior handle locks of many caravans and motorhomes. These locks mount between the door and the door handle without the need to drill or screw into your vehicle. The zinc casting makes them very robust and includes a lock cylinder with lock cover for that extra line of defence. 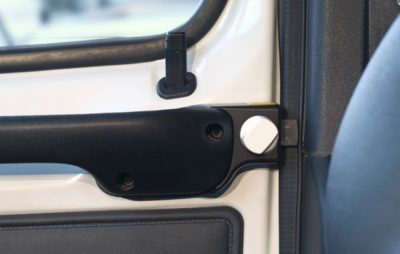 The HEOSafe motorhome driver’s cabin door lock is mounted on the inside of the vehicle – in some cases uses the existing manufacturer fixings – and is designed to increase the security of this point of entry by providing a deadlock on the door. There are then a range of other locks for the habitation doors of different motorhome base vehicles, which will mean the drilling of holes on the inside of your vehicle, but will add an extra layer of security. 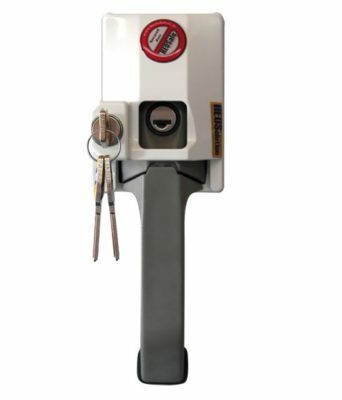 Key features: Robust, fairly easy to fit, visible deterrent. Caravanners can make life more difficult for would-be thieves by locking their corner steadies in place. The Torpedo Caravan leg lock from Purple Line fits over the winding points of your corner steady legs, securely locking them into place. 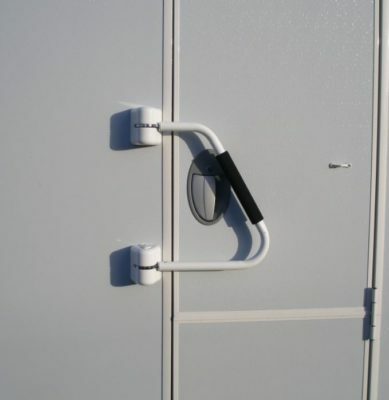 When used in the down position this locks the corner steadies to the floor, immobilising your caravan. 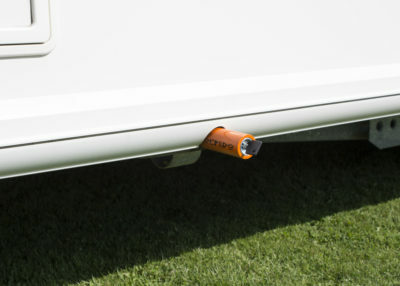 Torpedo Caravan Leg Locks are also highly visible to attract attention , acting as an extra deterrent to potential thieves. The Torpedo is a robust, strong, leg lock constructed using heavy-duty composite metals that have been specially chosen to be resistant to cutting, drilling and gas freezing. Key features: Quick and easy to fit; highly visible; resistant to cutting, drilling and gas freezing. Whilst none of these devices will get you a discount on your caravan or motorhome insurance they will act as a visible deterrent and perhaps make thieves think twice about trying to break into your caravan or motorhome, or worse still, steal it! So they could help to keep your no claims discount intact. What’s more the window and inner door locks give you extra peace of mind when you are staying in your caravan. Got any advice on security locks for your caravan or motorhome to pass on to others? Do you use any of the products we’ve featured? Feel free to add your comments below. In response to Andy Culley’s comment “nightmare getting a new passport when yours is stolen in Europe” – readers should be reassured that -YOU DON’T HAVE TO! As long as you report to the local police station AND get a crime sheet / number, that becomes your “new” passport. You produce that as your passport as necessary, at customs they will arrange a telephone call to the UK Customs and a few questions to check your “authenticity” and you can then get a proper replacement at home. Otherwise you will pay for a “TEMPORARY” passport while abroad and STILL have to arrange a replacement on your return. We had ours stolen while cycling through France and after a very helpful phone call to the Bordeaux embassy were assured we didn’t have to detour into Bordeaux and WASTE money on a temporary passport…..and they were right. We produced it all over France with no problems apart from apologetic campsite owners – that THIS had happened in their country!!! As someone else said, if they want to get in they will. Our VW van conversion was broken into in Spain last year and valuables stolen. We were away from it for only 15 minutes! How did they get in you ask? Because the converter had used the bog standard top hung plastic windows with plastic window catches, they just got their fingers under the bottom and pulled, snapping the catches. Not content with that they did the same to the other side window and then proceeded to rip out the concertina blinds! These same windows, made by Seitz are fitted to many caravans and motorhomes. So fitting extra locks will not keep them out. A Dutchman we met in Spain told us he has 2 safes in his camper van, a cheap in full view that he keeps copies of insurance papers etc in, and a better safe, hidden from view for passports etc. Might be worth a thought? Sorry to hear about your break-in Peter. A safe is a sensible idea for valuables. Get a dog! Variable starting costs, ongoing companionship, transferable between van changes. Only downsides is potentially expensive visits to the vet, some more difficult to train than others. Additional locks inan attempt to prevent unauthorised access are pretty much a waste of time. Just think of how strong the standard window locks are! They are made of plastic and are fitted to plastic windows. One good pull on the bottom of the window and they fail! A FAR better option is to fit a decent safe in which to store your valuables in. it WONT prevent unauthorised access but it WILL keep your valuables safe. Trying to get a passport replaced whilst abroad is a real nightmare. Additional exterior security devices such as steady locks etc do offer additional protection against theft OF the caravan but not FROM it. Good review on locks, better to be able to know where your caravan is, than was, parked, security is always a well sought after topicto take care of your possessions, but having said that if they want it they’ll take it, and having seen what protections you put on you van they’ll move on to one that hasn’t. An excellent article which clearly explains the options available complete with costs and fitting details. If fitting is to be undertaken by a dealer or workshop there will of course be additional costs which are likely to exceed the cost of actual devices. What about corner steady locks for trailer tents with 17mm steady screws? Nobody seems to make them! Here at Caravan Guard we already offer many discounts for axle wheel locks, alarms, tracking devices, as well as devices which improve safety such as reversing cameras and tyre pressure monitors. The article simply aimed to highlight other devices which you can fit to your vehicle to improve security to make life more difficult to potential thieves and give you that extra peace of mind. Having had just had our quad stolen in the last week I was wondering about additional security for my motor home. At the moment it only has a wheel lock which I find difficult to use having abad hip and getting down to fix it onto the wheel is not easy. Ihave been thinking about a tracker which you don’t menttion but it’s not qite the same. Since I’m new to Motorhomes I found the article very helpful. I find that a Fiamma Duo Safe Security bar is us useful (visible) additional deterrent to potential thieves of motorhomes. 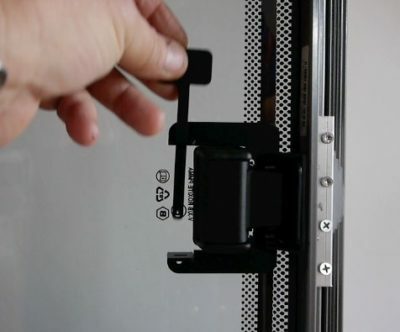 The bar (consisting of two telescopic sliding pieces) that fit inside the cab of your motorhome, and slide down on each side between the door glass and the inner door moulding, preventing the doors from opening from outside. Once in place the sliding component of the bar is locked into place making the bar very rigid. Like any other security/ deterrent it can be overcome by a thief, in this case by breaking a side window and removing the bar, but in our case I have alarmed the bar with a vibration/ alarm sensor which will make things that bit more noisy and difficult for a potential thief. I can vouch for the Lock-Me-Out devices. I have no connection with the supplier but bought some when at a Motorhome show. They are not cheap but as they are manufactured to a high standard and therefore very sturdy, I would highly recommend them.